Last Saturday spring finally sprang, and while all of New York headed outside in a celebratory exodus to the parks, streets and any open spaces with a ray of sunlight shining down on them, Flaneur and I decided to leave the city all together. We had been talking about escaping the city one weekend but because of all the time that goes into planning even just a two-day trip, I kept putting it off. You have to pick a place, figure out how to get there, then find things to do while you’re there, places to eat (always an important part of the research) and where to stay if you’re spending the night. But then, as if he read my thoughts, someone at work asked if I’d ever been to Rhinebeck, New York in the Hudson Valley. No? Well I should go, he said. And while I’m there I should stay at America’s oldest operating inn, the Beekman Arms, and I absolutely must eat at Le Petit Bistro. Rhinebeck is a lovely little town, peaceful and quiet with minimal to do other than just plain ol’ relax, which we did a lot of. But our biggest reason for going, the main attraction of our trip and what sold me on the idea, was the cozy French restaurant my coworker had raved about. As I do with everything else, I Googled it before going. The website was cheesy and dated and the photos of the interior gave it a boat cabin feel, with all the woodwork it had going on. I trusted my coworker, who swore that the restaurant was much better looking in person and that I really did have to go. And good thing I did because he was definitely right. 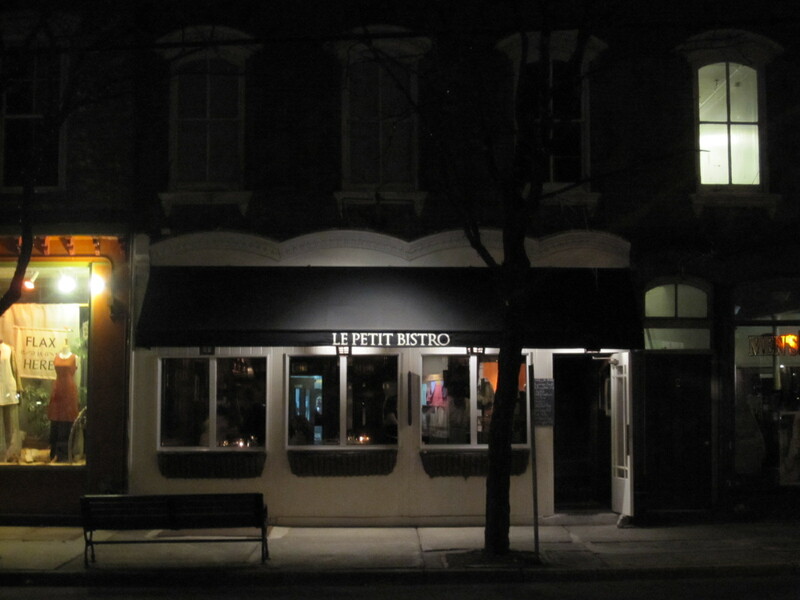 Le Petit Bistro was cute and inviting, with a soft glow coming from the small candles on each table. The wood on the walls, angled ceiling and bar was actually really pretty and created a warm, intimate feel very unlike the photos on the site. We showed up for our 9:30 reservations and were seated at a small table toward the back of the restaurant. A few minutes later, we were told that a table by the window had just opened up and if we wanted to we were welcome to move up. A small gesture but it spoke a lot about the kind of service here. I was impressed. The menu was short, which Flaneur and I appreciated since too many choices just lead to panic and scrambling at the last minute when the waiter shows up. We got our order in and sat back with glasses of red wine. Ah, now this is the life. Appetizers came out and I was both nervous and excited. Excited because they looked and smelled delicious, but nervous because what I ordered, in keeping with the French theme, was escargots de Bourgogne, and the last time I ordered escargot, at a small bistro in Paris, I spent the entire next day puking in the streets, on the metro and finally on my plane ride back to Italy. It was not pretty but I didn’t want one little bout with food poisoning to keep me from enjoying this iconic dish. 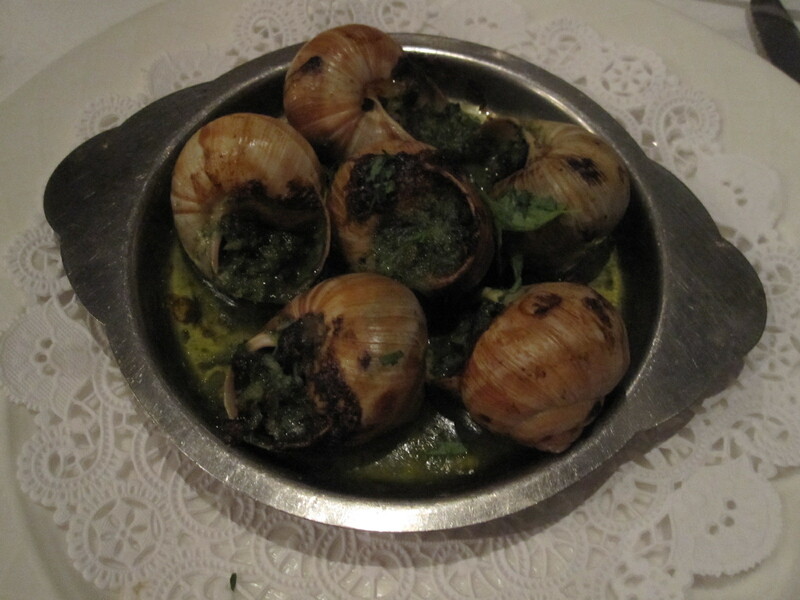 After pulling the first escargot out of its shell and plopping it my mouth, I completely forgot I’d ever been sick at the hand of one of these tasty little delicacies. Juicy and plump without being chewy or gummy, the delicious butter-garlic-parsley combo made each one a scrumptious mouthful. When they were done, I double-checked all the empty shells to make sure I hadn’t missed any. No such luck. Flaneur’s appetizer, the grilled sardines, was part of the special’s menu (which was written on a chalkboard and explained to us in mouthwatering detail at our table). 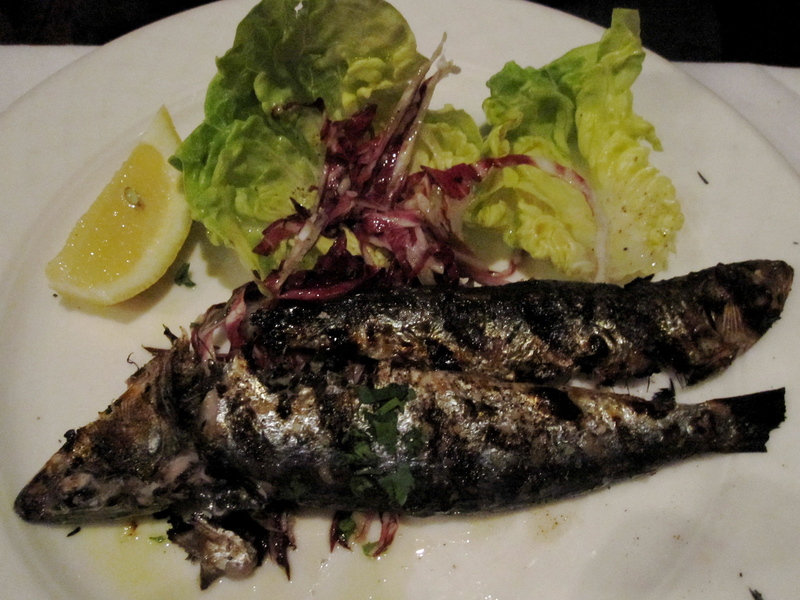 When I hear sardines I think of the scrawny guppies that come in a can but the two on Flaneur’s plate were big and meaty. With a squeeze of lemon juice over them, they were tangy and delicious, yet subtle and not overly fishy. 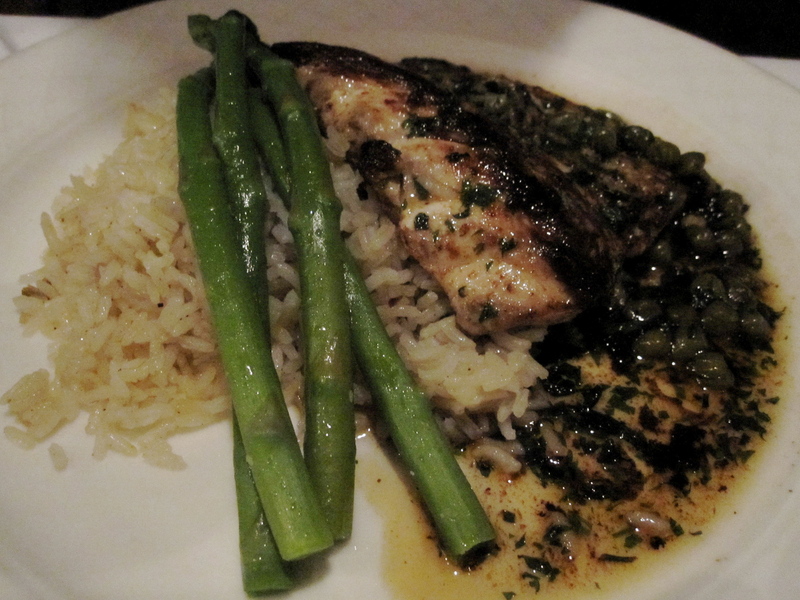 Sticking to seafood, Flaneur ordered another specials item: the grilled sea bass. Served atop a simple but delicious bed of wild rice and paired with the same perfectly cooked asparagus, the bass was the perfect blend of buttery and lemony without being too salty or overpowering. Capers added a little zing of flavor to each bite. Even though we were stuffed, there was no way I was leaving without dessert, so Flaneur and I decided to split one of my all-time favorites: the creamy, the classic, the delightfully crisp-on-top icon of French sweets, the crème brulee. And as I suspected based on the rest of our meal, this one did not disappoint. Under a golden brown caramelized crunchy top layer (which always makes me think of the scene from Amelie where she tap, tap, taps the top with a silver spoon) was a cool, thick, butter-colored cream. Absolutely delicious and the ideal ending to a perfect dinner. The next day we went back to the city, back to the noise and the crowds and the work routine. But the next time it all gets to be too much, we know where to go, and most importantly we know where to eat. 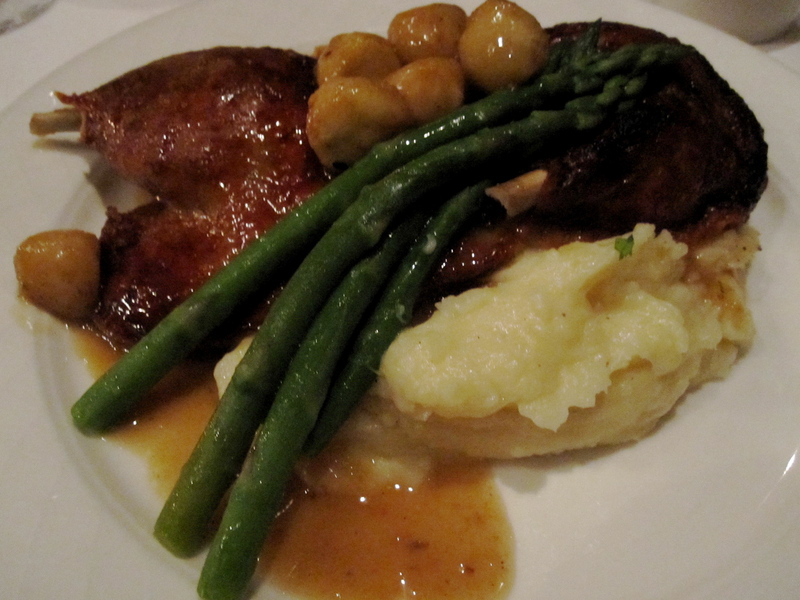 This entry was posted in Dinner and tagged creme bruleè, duck, escargot, french, Hudson River Valley, Le Petit Bistro, Rhinebeck, sardines, sea bass. Bookmark the permalink. perfect description! makes me wanna lick my computer screen. haha thanks! I won’t judge you. 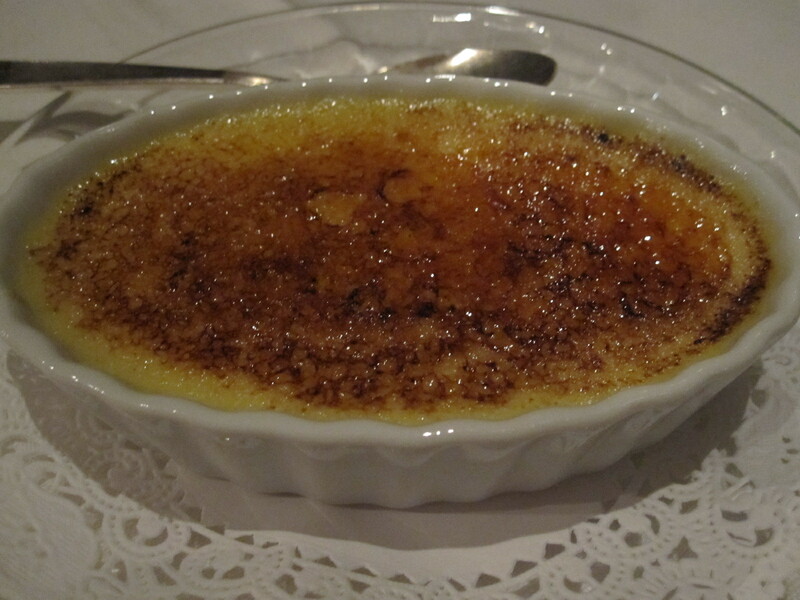 a perfect créme brulée is hard to find: this one looks amazing! The ultimate proof is trying to break the caramel with a spoon….it should “crack”! Yup! Definitely true! You have to crack it with a spoon and this one had the perfect snap to it. Mmm, getting hungry just thinking about it.